The idea that we might one day escape Earth's gravity first took shape in the mind's eye of poets, ascending aloft on the wings of a bird, horse-drawn carriages, flocks of wild geese and other similar “flights” of the imagination. By the 17th century, writers had begun thinking about the propulsion needed to achieve this dream in much more precise and technical terms. For example, Cyrano de Bergerac dreams of a smoke-filled sphere and a vehicle “propelled by successive saltpetre fires”, a sort of strange prototype of the modern-day rocket. It was Jules Verne who took the scientific novel to new heights. Such was his attention to detail that he even had his trajectory calculations checked. His story of three astronauts catapulted into space not far from Cape Canaveral in Florida was far ahead of its time, prefiguring the beginnings of human spaceflight one century later. And then there was Tintin, of course. While Ariane did not go so far as to cloak itself in the chequered red-and-white livery imagined by Hergé, it nonetheless drew inspiration from him. And Professor Calculus must have been on good terms with some real-world experts, because in the race to land the first man on the Moon, Tintin beat Neil Armstrong to it. So, all in all, we can say that modern rockets are the fruit of several centuries of imagination. 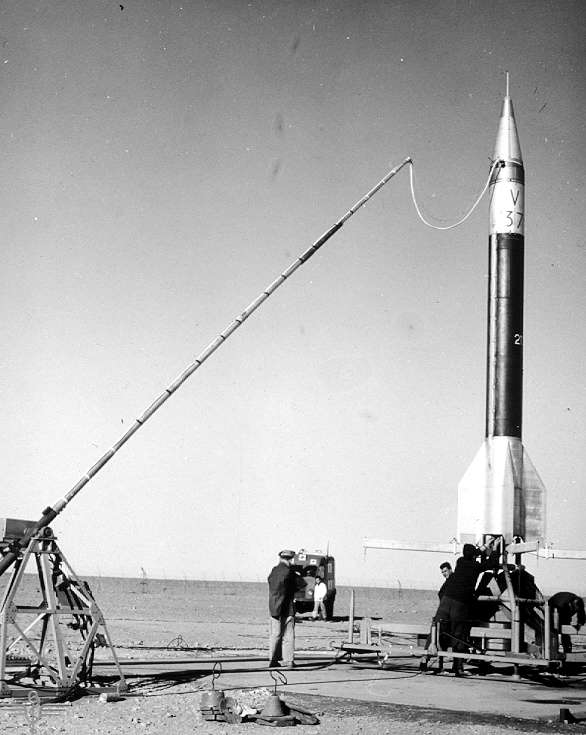 The first such rocket capable of sending man-made satellites into orbit was produced by the ex-Soviet Union in 1957. The United States followed suit one year later, and France in 1965. This rocket was designed to lift a payload above the atmosphere at sufficient speed to place it into Earth orbit or send it into deep space. Yesterday’s dream had become reality: the launcher was born. The word rocket is used in everyday language, but in space terminology launcher is more common, especially when talking about satellites. The term rocket also often refers to a low-power reaction engine, or rocket engine. .
A rower propels a boat forward by pushing with oars against the water. A bird’s wing pushes against the air. But what do you push against in the vacuum of space? In 1883, Russian scientist Konstantin Tsiolkovsky solved this problem by imagining a rocket engine able to generate its own momentum in the atmosphere and in space. If friction between the vehicle and the ground is low enough, simply throwing a projectile hard can create motion. In a rocket engine, the projectiles are large amounts of gas molecules ejected at very high speed. The actions of two bodies upon each other are always equal and directly opposite. This principle is easily illustrated by our analogy of the rower: the water reacts in an opposite direction to the action of the oars, thus propelling the boat forward. Isaac Newton (1642 – 1727) was a mathematician, physicist and astronomer who laid the foundations for the future development of mechanics. Rocket propulsion is currently the only means of space transport we have. It is based on a natural principle formulated by Isaac Newton, called the principle of action and reaction (see box). A rocket engine expels large quantities of gas at very high speed, in a given direction. As a reaction to this flow of gas, the launcher is propelled in the opposite direction. The force thus delivered, called thrust, must exceed the mass of the launcher to set it in motion. Gases are generated by burning a fuel with an oxidizer. Both substances, stored in huge tanks, are called propellants and make up most of the launcher’s mass. Using a railway analogy, we could say that a launcher is like a train with 100 cars, but only one is for passengers and the remaining 99 are tank cars. The unit of measurement for the propulsive force generated by an engine, called thrust, is the newton (N). Although thrust is often expressed in tonnes (t), this is incorrect. The value in tonnes indicates the mass that a force is capable of lifting. Tip: to better appreciate what a force expressed in kilonewtons (kN) really represents, simply divide the value by ten to obtain the approximate corresponding mass it can lift in tonnes. For example, a force of 650 kN can lift a mass of about 65 t.
Most modern launchers are used only once and are not recovered. Such launchers are termed expendable, in contrast to fully or partly reusable launch vehicles, like the US space shuttle. To reach its required altitude, a launcher fires several propulsive stages in succession. Once each stage has fulfilled its purpose and burned up all its fuel, it falls away, significantly lightening the launcher and thus increasing its speed. This balance between fuel and mass is vital to ensure that the launcher escapes Earth's gravity without falling back into the atmosphere. A launcher is cylindrical in shape and consists of two to four stages containing large fuel tanks. The first stage is often augmented by strap-on boosters to provide extra thrust at lift-off. Although simple at first sight, this concept is in fact quite complex in practical terms, since a multi-stage launcher requires several engines—at least one per stage. The fairing protects the payload from heating by friction as the launcher ascends through the atmosphere. 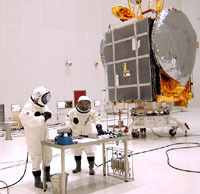 For dual launches, two satellites are mounted on a special payload attach fitting. Last but not least, the launcher’s brain is housed inside an equipment bay containing all the automatic guidance and navigation electronics. These systems control engine operation and vectoring, stage separation and jettisoning of the fairing, and transmit data to ground control engineers tracking the flight. Rocket engines generate a propulsive force by converting the energy released by chemical reactions between the propellants. The gases produced are accelerated and expelled through a nozzle. Two types of propellant are most often used. Solid propellants combine both the fuel and oxidizer in a rubber-like block. They are easy to store and handle, and relatively light and compact. 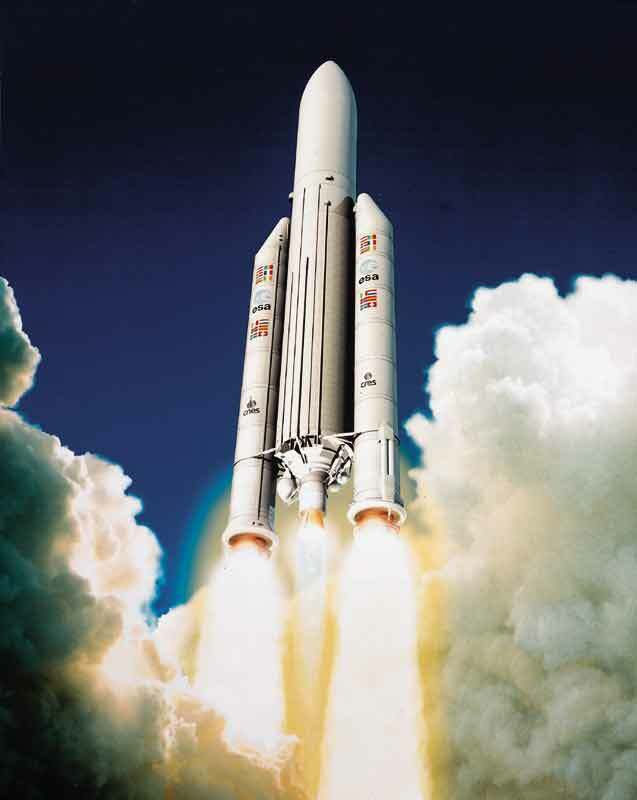 As they quickly deliver a large amount of thrust, they are often used at lift-off. Their only major disadvantage is that once ignited, they cannot be shut down. For this reason, it is impossible to stop the launch of a rocket on the launch pad once it has passed this point of no return. Storable propellants are easily stored at room temperatures. They combust spontaneously as soon as the fuel and oxidizer come into contact, thus facilitating engine ignition. Cryogenic propellants are much harder to store. They are often liquid hydrogen and oxygen, which must be stored at very low temperature. As a result, they are very difficult to handle and only limited types of materials are used. Hydrogen is also not very dense, so large fuel tanks and powerful turbopumps are needed to obtain the necessary pressure and flow. The chief advantage of cryogenic propellants is their performance: they generate very hot gases that are expelled 50% faster than with other propellants, thus reducing fuel consumption. Oxygen (O) liquefies at –182.96°C. Above this temperature, it is in its more familiar gaseous form. Oxygen is found in the air and in water, and plays a key role in the process of combustion. In terms of mass, it represents eight-ninths of water and half of the Earth’s crust. Hydrogen (H) liquefies at –252.87°C. It is the most abundant element in the Universe. It is extremely light, weighing only 70 grams per litre. In comparison, one litre of water weighs one kilogram. Chemical reactions are today the only means of obtaining enough thrust to power a launcher. Combined engines still in development propose to use oxygen present in the atmosphere, thus reducing the mass of fuels carried by the launcher, but such solutions are much more complex. Other technologies being considered generate lower levels of thrust sufficient for orbital manoeuvres and satellite control, but they are nowhere near powerful enough to overcome the pull of the Earth. Launcher construction involves contractors at different sites, but final launch preparations are centralized at the launch base, which comprises a launch pad, mission control rooms, assembly buildings, technical facilities and equipment for transporting the launcher to and from the pad. Safety of local populations, since a launch involves emissions of large amounts of gas, falling away of launcher stages and the risk that a launcher might have to be destroyed in flight. Latitude: the closer the site is to the equator, the more the launcher can take advantage of the Earth’s rotational speed. Preparations leading up to launch last about one month, depending on the complexity of the mission. During preparation and assembly, the launcher’s stages are mated together. 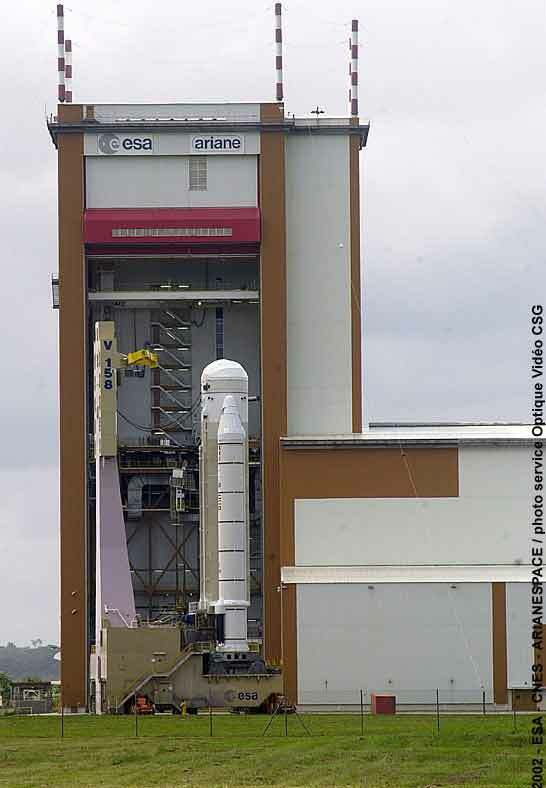 Europe’s ARIANE launcher, for example, is transported upright without its payload fairing to the launch pad. Satellites are prepared and fuelled, then encapsulated inside the fairing and hoisted atop the launcher. After the launch rehearsal designed to check that all systems are working, the launcher is fuelled with its storable propellants the day before launch and with cryogenic propellants a few hours before lift-off. Final checks are conducted during the synchronized final countdown sequence, and the vehicle is only cleared for launch if everything is nominal. At the end of the countdown, which lasts a few minutes, the launcher lifts off from the launch pad. To succeed, a launch mission must meet several key conditions. First of all, it is necessary to determine the best time to place the satellite into orbit. This period is called the launch window. The choice of window depends on the Earth’s rotation and on the geographical position of the launch base with respect to the plane of the injection orbit. Contrary to popular belief, acceleration of the launcher must be gradual, otherwise the payload could be damaged. Also, orbiting a satellite involves more than simply gaining altitude, which is why imparting vertical propulsion is not enough. To get into the right orbit, a satellite must also achieve a certain horizontal velocity. In the first minutes after launch, the launcher ascends vertically to escape from the dense layers of the atmosphere as quickly as possible, because at lower altitudes it is impossible to overcome the resistance of air when travelling at very high speed. So the first stage is the largest, lifting the launcher beyond the Earth’s gravity into space before its speeds up too much. This phase of the launch takes the vehicle to an altitude of about 200 km. The launcher then gradually transitions to a horizontal trajectory. The thrust generated by high-velocity expelled gases allows the launcher to accelerate to at least 28,000 km/h. By this time, the fairing is no longer needed and is jettisoned. During the final minutes of its flight, the launcher stops gaining altitude. Once it has reached the desired velocity, the engine cuts out and the launcher releases the payload, imparting its velocity at the same time. The satellite is now operating on its own resources. The launcher is monitored by ground control throughout its mission, and by tracking stations along its chosen trajectory. Once a satellite separates from the launcher, it still has some way to go before reaching its final orbit. Satellite positioning operations, controlled from the ground, take the satellite to its intended position on orbit. For this reason, the satellite has its own thrusters for performing orbital manoeuvres and trajectory corrections. Engineers receive monitoring data by telemetry sent to ground automatically by the launcher.